The Chihuahuan Desert is More Than You Think! The Chihuahuan Desert surrounds the City of Tombstone Arizona. This desert has its particular types of plant-life. But within this zone is much variability. It's dependent on the elevation. The elevation of Tombstone is 4,541 feet above sea level. In Chihuahuan Desert areas, for an elevation increase of 1000 feet the temperature drops by 3.5 degrees Fahrenheit. Bisbee, 20 minutes Southeast, is about 1000 feet higher. It's normally that much cooler than Tombstone. This difference in temperatures in the Chihuahuan Desert also has an effect on plants in an area. To some degree, it affects animal life also. Another aspect is sunlight and mountains. On northern sloping areas, out of most direct sunlight, the temperature can be much cooler. For instance Tucson Arizona is in the Sonoran Desert. I believe it is one of the most beautiful deserts (if not the most!) in the world. The plant-life is abundant, diverse, unique and extraordinary. Tombstone Arizona is about 70 miles from Tucson. 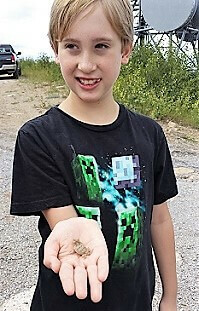 Yet Tombstone is in the Chihuahuan Desert, has a 2,352 foot higher elevation, gets about 2 inches more rain each year, yet has less varied natural plant-life. Let's take a closer look at the Chihuahuan Desert. There are some typical, common animals you may experience when you travel the Tombstone area. Some are less common. You might see these while hiking. That would be an exciting experience! Sometimes welcome - other times, maybe not! Javelina - People sometimes refer to them as a "pig." They sort of look like a wild variety, but they are a peccary. They're usually found in family groups. They have poor sight, but a good sense of smell. Coues Deer - A small white tail deer variety. There's a black tip on the tail. Often seen around town at dusk. Coyote - Usually heard more than seen, making a crying yip-like sound. When seen, they're often alone. In winter, they do gather in groups. They'll hunt small animals, or eat carrion. They are very wily! Mountain Lion - Also called a cougar, or sometimes a puma. They're very adaptable, though they prefer mountainous areas. More often they'd be seen while hiking. But an unusual encounter. They have been sound on occasion, around the Tombstone area. So they're known to be into the Chihuahuan Desert. 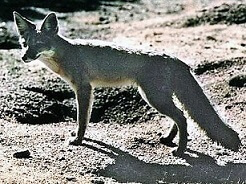 Kit Fox - Usually seen as darkness approaches, but not easily! I've seen them rarely. They hunt small animals, but will eat fruit if needed. Horned Toad - It's really a lizard. AKA horny toad, horned lizard, etc. They look dangerous, but are harmless. They're seen less because their environment is diminishing. That's sad. I think they're cute! 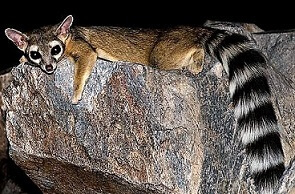 Ringtail - These guys are real "night owls"! Their excellent eye-sight serves them well in the dark. They like rocky canyons, and even mine shafts. So the Tombstone Hills serve them well! They have a fluffy tail with black & white ringed stripes. They're related to raccoons. Black-tailed Jackrabbit - You'll notice its huge ears that help eliminate heat. Their eyes are high up and to the side on their flattish head. This helps them see almost fully behind them. They're not a rabbit, but a hare. Which means babies are born with open eyes and fur. Western Diamondback Rattlesnake - A pit viper - heat sensing openings behind their nostrils. You'll notice the triangular head shape and the black & white stripes just in front of the rattle. If it rattles at you - heed the warning & back off! Gila Monster - A stocky lizard, it's black with pinkish orange markings. It's venomous. If it bites, it chews to release the venom. Human attacks are exceedingly rare (provoked!). AZ law protects them! (Illegal to collect, kill or harm them.) So please, don't bother it - it won't bother you. Scorpions - 2 kinds in the U.S. Chihuahuan Desert. They're nocturnal ancient creatures. They show up under black light! Typically these scorpion stings don't cause death - but if an allergic reaction occurs - that changes the situation! The most harmful is the Bark Scorpion. It climbs & it's the one that gets into homes. It likes cool, moist areas with good air flow. It's small & light colored. The sting can be life threatening for those with health problems. 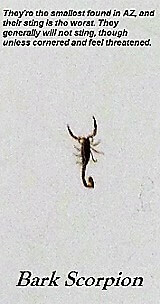 The Stripe Tailed Scorpion, the most common here. You'd find it when turning over a rock or under a garbage can. They're about 2 inches long. It looks vicious when threatened, but if stung it's more like a bee-sting. 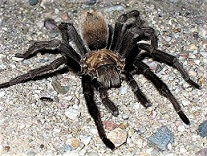 Western Desert Tarantula - Sometimes called the Arizona blond tarantula or the Mexican blond tarantula. They live in burrows in the ground. The opening is about quarter-sized. It has a silky lining or covering. The male is black with tan markings. The female is tan with blondish hairs. Abdominal hairs have irritating barbs. Their bite is venomous, but not deadly. You'd have to really annoy them to have them bite you - so be nice! Gambel's Quail - These birds walk along the ground, in very cute family groups. Males have a colorful face with a black front mask & bright rusty cap. Both genders have a black feather plume. Roadrunner - This amusing bird has been the subject of a cartoon. And they're quite entertaining to watch when you encounter one. They normally have a route they follow, and our yard has been lucky to have been along one! They're a kind of cuckoo. 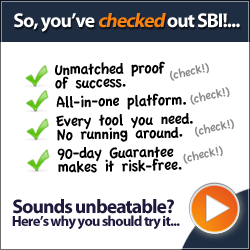 They run along the ground and you might see one run across the road in front of your car. They don't fly much. They can feed on rattlesnakes! Gila Woodpecker - They have an unmistakable personality. Look for their red cap and black & white striped back. You'll really notice them when they nest in an excavated hole in a tree or large cactus. They'll make loud calls. Specific plants are native to the Chichuahuan Desert. They can also cross over into other Desert Biomes as well. We'll go over a few of the very noticeable plants you may wonder about as you travel through the area. Tumbleweed - You'll see it fly by, maybe even get stuck under your car - on a windy day! What is it? You probably noticed it in those Western movies. There's even one named for it! About 10 plant families produce tumbleweeds. As the annual plant dies, it breaks off. The wind blows it elsewhere to distribute its seeds. The one usually seen here is known as Russian Thistle. Ocotillo - Easily identified, with its tall green/brown spiked stems out of its base. With rain, it sprouts leaves. During dry spells, the leaves fall. Orangey flowers bloom at the top from March til June. The Ocotillo - A Desert Survivor! Prickly Pear Cactus - This Opuntia family group grows in various areas throughout the desert region. Easily recognized as well. But be careful - most types have thorns and tiny painful spines. Soap Tree Yucca - You'll see them in the open desert and also on slopes. They tend to grow in groups, one after another. They have a base of pointed leave. A flowering tower shoot grows from the middle, from 10 to 12 feet tall. Mesquite Tree - It has small green leaves, often some thorny branches, and flowers in the spring. A pretty tree that spreads wide and grows about 30 feet tall. It produces some good and well appreciated shade. Its bean pods have been used for food by Native Americans. There are not any mountains right in Tombstone itself. Tombstone is surrounded by the Hills of Tombstone - where the miners of the 1880s sunk their silver mine shafts. To the Southeast, in the Bisbee area are the Mule Mountains. Make climbs to Ballard and Fissure Peaks - 7,370 ft. Accessed via Old Divide Road turnoff. That's a little over 1/2 mile before the tunnel going into Bisbee. Or take the Mule Pass Road out of Bisbee. In the East are the immense Chiricahua Mountains, which have many options. Investigate Chiricahua National Monument and Fort Bowie National Historic Site. A very special place. The great Apache warrior Cochise is buried here - we can't tell you where. One area that's a must-do/see is Cochise Stronghold. But there are other areas, many historic, to check out in the Dragoon Mountains. 1 Phillips, J. (2015). Growing the Southwest garden. Portland OR: Timber Press.